Everyone from Sting & Peter Gabriel to Red Hot Chili Peppers to Rammstein will be there... will you? For a full 11 days in July, downtown Québec City plays home to one of the biggest and best festivals not just in Canada, but North America at large. 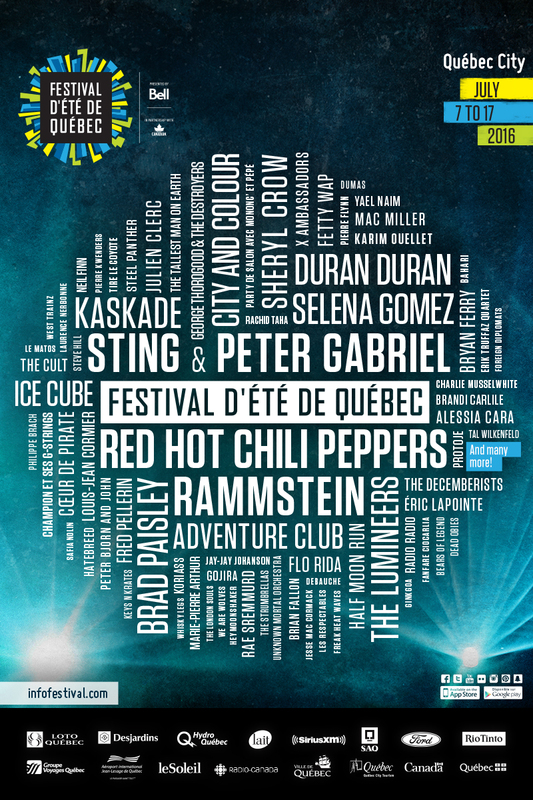 This year’s edition of Le Festival d’été de Québec (aka Quebéc City Summer Fest) will feature 300 shows taking place in 10 venues from July 7th to the 17th. Size aside, this year’s festival once again comes up big in the lineup department. QCSF prides itself on its diverse bookings, and you can see that right away with the top billed acts. Sting & Peter Gabriel, Red Hot Chili Peppers, Rammstein, Ice Cube, Kaskade, Duran Duran, The Lumineers, Brad Pasiley, and Selena Gomez will each headline the massive, 100,000-capacity Bell Stage on the landmark Plans of Abraham. Those names alone touch pretty much every genre and era you could possibly want, but somehow it gets even better. Other performers on the schedule include Bryan Ferry, The Decemberists, City and Colour, Fetty Wap, The Tallest Man on Earth, Brandi Carlile, Unknown Mortal Orchestra, Peter Bjorn & John, Alessia Cara, Sheryl Crow, Rae Sremmurd, The Cult, Lord Huron, Neil Finn, Adventure Club, Mac Miller, Brian Fallon, and more. That incredible variety makes passes to the event some of the hottest festival tickets of the summer. So we’re gonna help you get some. We’re giving away one (1) pair of GA passes to the festival so you and a friend can experience all Québec City Summer Festival has to offer. To enter, just fill out the widget below, earning extra entries for simple social media tasks. Winner must provide their own transportation and accommodations. Entry automatically enrolls you in the Consequence of Sound newsletter.